While that is definitely true, you have probably realized by now that it’s not just about securing the next position; rather, you can hopefully select a role that is right for you. With promises of larger salaries, bonuses, flexible work schedules and other perks, it can be tough to make the right decision. So how do you cut through the noise to hone in on a role that’s right for you while also effectively marketing your skills? Join the technology community out on GitHub! As a tech recruiter, I always encourage technology professionals to sign up for and become active out on GitHub, CodePen, and other primary software development communities. Before I tell you why, let’s explore the functionality of GitHub a bit. GitHub is an online open source community where users can build out their profiles and develop repositories of code that can be shared with other developers for collaboration, and with potential and current employers for review and testing. It also offers integration with third party tools. There are more than 10 million users on GitHub and many tech pros make it a point to spend some time out there every week or even every day. So imagine the possibilities of expanding your network by connecting with these developers, sharing your work, asking questions, and commenting on other projects. And given the breadth of skillsets out there, you can really hone in on subsets of this community who hold similar expertise and interests. For companies and potential employers who spend time out on GitHub, there is an unbelievable wealth of information to be had about tech professionals. And this information really takes them well beyond the traditional resume and interviews. It can also make all the difference in the initial evaluation stages of candidate searches; for example, if a company is looking for a Ruby developer with jQuery experience, it’s very easy to locate specific developers who possess these skills and check out their code projects. This becomes your portfolio and ensures that potential employers see your work first hand. Just as companies can visit your profile and see your projects, you also potentially have the ability to see what they are up to – how they work, who their developers are and the types of projects they have going on. Not all companies will have accounts and projects out there, but oftentimes their developers will have accounts on GitHub. 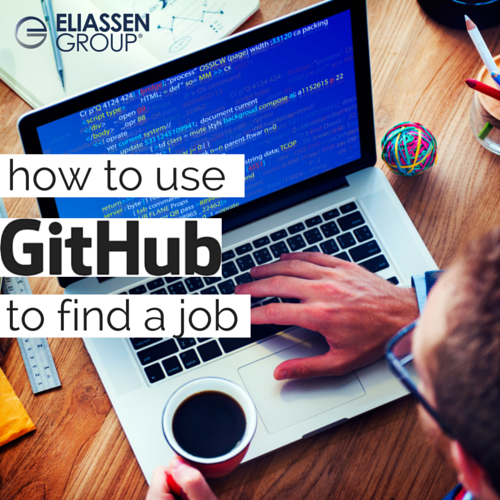 Essentially, GitHub is a way for you to market yourself and your skills, and also find a role and a company that make the most sense for you personally. Sites like GitHub offer a level of transparency on both sides that make the job search and recruiting process a lot more interesting and effective. Do you have a profile out on GitHub? We’d be very interested to hear your thoughts about these tools as an effective way to market your skills. Have questions about using tools like these? Give us a shout and we’d be happy to help out: solutions@eliassen.com.